When you visit Gatlinburg, Tennessee you will discover an array of exhilarating and unique attractions for the entire family. Attractions include an amusement park and ski resort, horseback riding, miniature golf, laser tag, entertaining museums, a 342-foot tall Space Needle with observation deck, the world's largest movie screen (at the Great Smokies Mega Theatre) and the Ober Gatlinburg aerial tram (America's largest). Also in the Gatlinburg, TN area of the Great Smoky Mountains (including Pigeon Forge), you will find several magnificent dinner theaters and an assortment of musical shows featuring a wide range of entertainment including music, comedy and more. Hop onboard the Sky Lift in downtown Gatlinburg, Tennessee and enjoy the open air ride as you cross over the Little Pigeon River and ascend to the top of Crockett Mountain. Once you reach the mountaintop, you'll discover the magnificent, scenic panorama from Gatlinburg's #1 scenic overlook. The Gatlinburg Sky Lift is open year-round. Sky Lift Video - - - More info. Enjoy the spectacular view of the Great Smoky Mountains from the Space Needle's 407 ft high observation deck. Visit the Arcadia Family Fun Center for the latest amusement attractions including the Hurricane Simulator, Lazer Runner (Extreme Lazer Tag), OH! Zone and the Hypnotized Theater. In Arcadia you will also find traditional favorites such as air hockey, billiards, skee-ball, basketball, pinball and more. A Tastee Freeze and Old Tyme Photos are also on site. Space Needle Video - - - More info. Ripley's 1.4 million gallon world-class aquarium features 11 ft sharks and over 8,000 exotic sea creatures from all over the world. Explore the world of piranhas in the Tropical Rain Forest; discover Indo-Pacific fish in the Coral Reef and journey through the world's longest underwater aquarium tunnel on a 345 ft glide path through the Shark Lagoon. Visit the Discovery Center and pick up a horseshoe crab or touch a stingray in the Touch A Ray Bay. Ripley's Aquarium Video - - - More info. Board the 120 passenger Aerial Tramway and enjoy stunning views year-round. The tramway travels regularly between downtown Gatlinburg and the Ober Gatlinburg Ski Resort & Amusement Park. Tramway Video - - - More info. Located in nearby Pigeon Forge, TN, Dollywood is a 150-acre, family-friendly, theme park in the heart of the Smokies. Dollywood features more than 40 electrifying rides and fun-filled attractions plus live shows, crafts, special events, unique shops and dining. Dollywood Video - - - More info. Enjoy the breathtaking views on board America's largest aerial tramway ride to the year-round mountaintop recreation and amusement park. In addition to great skiing, Ober Gatlinburg offers raft rides, indoor ice skating, an alpine slide, chair lift, chair swings, miniature golf, kiddie rides, wildlife including bears, otters & raccoons, an arcade, restaurant, lounge, shops and much more. Fall Video - - - Winter Video - - - More info. Visit our Gatlinburg cabins page and you'll find a vast selection of accommodations options ranging from spacious cabin rentals to luxury chalets. 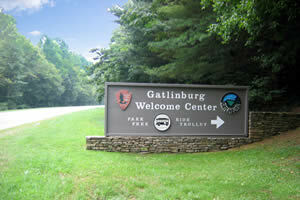 You can also visit our hotels page for lodging in downtown Gatlinburg. Visit Hazzard County and make yourself at home in the Dukes of Hazzard museum and shop, operated by the one and only Cooter (Ben Jones). Cooter's Place features pictures, props, costumes, and memorabilia from the show. Keep a look out for the General Lee and Cooter's tow truck. More info. Fort Fun is located in downtown Gatlinburg at Reagan Terrace Mall. Rain or shine you're assured of a day of fun with indoor activities and outdoor attractions that include laser tag, bumper cars, 2 outdoor mini golf courses, a motion ride theater, blacklight indoor mini golf course, hillbilly shooting gallery, 3D movie theater, gem mining and a video game arcade. Play laser tag in an a futuristic arena with sentry pods and home bases that fire back. Ride in ultra modern electric bumper cars. Enjoy fantastic 3-D special effects movies, where dinosaurs, sharks, aliens and more jump right off the screen. More info. The Smoky Mountain Angler, the oldest fly fishing shop and fishing guide service in Gatlinburg has Sage, St. Croix, Cortland and many more lines of fly-fishing gear. You will find commercial flies, hand-tied mountain flies, fly tying/rod building supplies and kits. The Smoky Mountain Angler is also an authorized fishing guide service for the Great Smoky Mountains National Park with fishing guides who are ready to make your trip one to remember. More info. Over 30 of the best Hollywood movie & TV cars in recreated settings with sound, lights, and action. To keep the museum up to date with current Hollywood entertainment, new cars are added nearly every year. 865-430-2200 More info. The Sweet Fanny Adams Theater offers a unique format that hearkens back to the music halls of the 1890s: Original musical comedies, outrageous humor and sidesplitting fun. A show that the whole family will enjoy! More info. Visit Gatlinburg's wildest virtual reality motion simulator and enjoy thrilling movies where the screen moves with the seats. The world's largest collection of action packed grand illusions, mystifying magic and interactive exhibits. Stop a tornado with a wave of your hand, make a friend disappear, see Merlin the wizard levitate before your eyes, walk away from your shadow, and more. Hop aboard subway train No. 13 and experience a heart-pounding, high-tech, live action adventure ride. Visit Fannie Farkles in the heart of Gatlinburg for a one of a kind concept in food and entertainment. Fannies offers great food and amusements at an affordable price. Live Ghost Show - The Ultimate Experience in Horror. Ride the incline 300 ft straight up above the city and play the world's most unusual miniature golf. Two demanding 18-hole courses with mountaineer perils at every turn...outhouses, stills, rocky walls and more. A classic, turn of the century haunted house with secret passageways, a dark dungeon, ghosts, spooks and things that go bump in the night. 1000's of unique and extraordinary artifacts collected by Robert Ripley and his team of archivists are on display at Ripley's Believe It or Not Museum. The museum has many exhibits, cartoons, and interactive displays to entertain the whole family. Crockett Mini-Golf features 36 beautifully landscaped holes on 2 mountain courses. The themed courses bring back the "old days" when Davy Crockett roamed "them thar hills". The interactive state of the art miniature golf course feature logs, steep drops, a black hole and a hillbilly outhouse that flushes if you hit the target. While playing you will be amused by interactive displays featuring raccoons, bears, possums, chipmunks, and more. Come and explore your nightmare. The Grimsby and Streaper Casket Company is leading tours through the old factory. Hear the screams and feel your way through the twisting corridors. Visit the state-of-art 3D virtual reality simulator with 6 channel surround sound and ride with the movie as you experience every bump, dip and turn in seats that move in eight different directions. Guided horse rides in the Smoky Mountains. Robust award winning wines...complimentary tour & tasting. Don't forget to take at least one day and visit the popular theme park, Dollywood in nearby Pigeon Forge, Tennessee. Dollywood attractions include: rides, food, music, and live entertainment.